Have You Ever Seen Rainbow Corn ? Would You Like To Grow Rainbow Corn ? Honoring The Circle's Next Planting season is for Spring 2014. Get in on the rainbow action by emailing internationalchildrensmonth@gmail.com today !!!! Some of Honoring The Circle from left to right: Lead Camera Man Mike Kirk, Singer/songwriter/ of ONE/ co creator of The Book of Honor/International Children's Month, Heidi Little. Program Director of Honoring The Circle/ Co creator of The Book of Honor/International Children's Month. 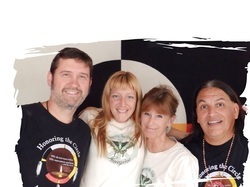 Chief Grey Eagle council of Honoring The Circle/Sundance Director/Co founder International Children's Month.